Recently we updated Plia’s blog and many of our posts disappeared. But this is a topic that needs a re-post. In the US, a macaroon (double o) is a coconut cookie. It’s a cookie that is well liked in the midwest and some southern states. 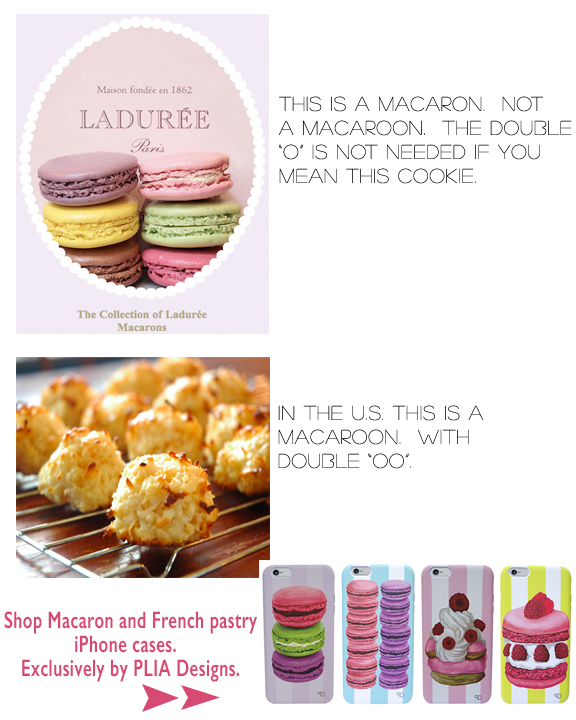 A macaron is a totally different treat/cookie usually available via French bakeries, etc. So don’t feel pretentious saying “macaron” with the French spelling. That’s how it should be! And there is no need to call it a French macaron or a French macaroon. A macaron is a macaron no matter where you live. It’s always surprising how many misspell and don’t even know about the other macaroon coconut cookie. And don’t forget to shop our collection of designer iPhone cases. They are some of the yummiest treats for your iPhone!